A Green Mushroom: Finally Fantasy (III) is Complete! Finally Fantasy (III) is Complete! I wanted to finish Final Fantasy III before the end of the year and I got it in just under the wire. My drive to power through the rest of the game and wrap it up was because I was stuck for such a long time. The last 20% of this game took me months and months simply because I didn't want to spend time grinding levels. 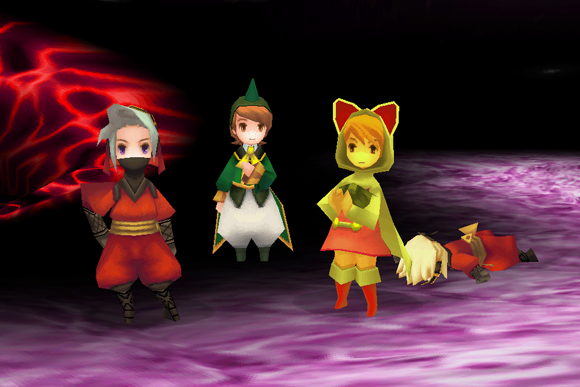 I would not recommend Final Fantasy III to other people. It's the most grindy Final Fantasy game that I've played so far, and I've played most of them at one point or another. FFIII was most definitely a slog, especially toward the end. I'm not a fan of games that have mandatory level grinding to finish the game and unfortunately this falls into that category. It wasn't a horrible game by any means, it just wasn't nearly as good as the other entries in the Final Fantasy series that I've played. It had a more fleshed out story and better characters than FFI and FFII which is nice to see. I also enjoyed the remastered 3D graphics which were a nice change of pace from the 2D sprites of the last two games. It's been interesting to see the emergence of Final Fantasy staples over the course of the first three games. Jobs finally made an appearance in FFIII and I had a lot of fun playing around with my party composition. It's not as refined as some of the later job systems, but it gets the job done (pun by accident, sorry). I don't know what else to say about this one. I'm glad it's done. I might take another break before diving into Final Fantasy IV. From everything I've read it has a much better story than any of the first three games, but I dread the potential grind of a new title. After this one, I definitely need a game with minimal or no grinding to keep me interested.